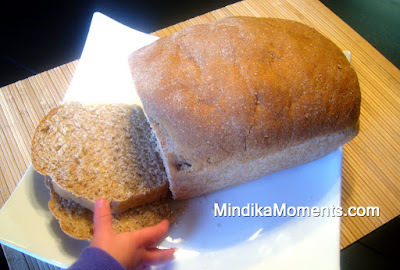 One of my earliest childhood memories is making bread with my mom. She made (and still makes) amazing homemade bread. When I was just a toddler, she was featured in our local paper for her bread. I don't really remember, but I've been told the stories and have seen the article, accompanied by a cute picture of my mom, my sister and I, all making bread in our kitchen. To this day there's nothing that takes me back to the innocence of childhood like a nice big slice of homemade bread right from the oven, with a little butter or fresh raspberry jam. So, when my mom gave me this recipe from a friend of hers, I knew it had to be good! After all, it's mom approved. And it did not disappoint! I took much better pictures of the bread, but I couldn't help posting this one of little "r" reaching for her much anticipated slice. Just like my mom did with me, "r" stood by my side the whole time, helping with every step of the bread making process. Then she gobbled up an entire warm slice with melted butter. 1. Dissolve the yeast in warm water with a pinch of sugar. 2. Add the wheat flour, butter, honey, salt and apple sauce. Beat until smooth. 3. Add enough of the remaining flour to create a smooth, elastic dough that can be handled. 4. Let rise until doubled. Form into three medium size loaves or two large loaves. 5. Place in a greased loaf pans and let rise until doubled. 6. Bake at 350 degree for 40-50 minutes or until done. looks so delicious!! I'll be posting this on my blog today. THanks for the recipe! P.S. I Love the logo. Your brother is very talented.